When you're paying $1,119 for a monitor, you need to get the most value for your money. 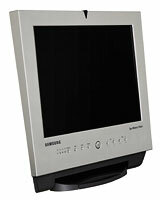 Samsung's SyncMaster 150MP is a computer monitor and television in one, with 1,024-by-768 resolution on a 15-inch screen. It's priced at $1,119. The 15-inch SyncMaster 150MP from Samsung Electronics America Inc. rises to the challenge, with all the bells and whistles you could ask for, including a TV tuner. A primary reason for buying a flat-panel LCD monitor is to save space, so what could be better than combining the monitor with a television? It even has V-chip and picture-in-picture capabilities that allow it to function in both modes at the same time. This is useful in an office because, for example, you can use it simultaneously as a PC monitor and a display for a security camera image. In my tests, the security camera image was far superior to one on a standard television. The unit's regular television reception is very good also. Back panel connections for the SyncMaster 150MP include VGA, RCA Cable and S-video connectors, television antenna and stereo input and output. Front panel controls let you select from among four video sources. And there's even a full-featured remote control'something you don't get with the average monitor but which is very useful, especially if you mount the monitor on a wall out of easy reach. This monitor uses an analog interface, so it connects to all desktop and notebook PCs. And while an analog interface can cause shaky image quality in some LCDs, the image was excellent on the 150MP. The 150MP and the larger but otherwise identical 17-inch 170MP were the first LCD monitors to include extensive TV capabilities. And as far as I could determine, they are still the only combination TV/monitors available, so if you need the TV feature, picking one of these Samsungs is an easy choice. Even if you don't need the TV tuner or video capabilities now, the 150MP is comparably priced to other 15-inch LCD monitors and the quality is excellent, so it's still a good choice to make.